Works well with Windows 7 clients, Android, iOS and Blackberry. Smart IP settings may not work with your router setup. 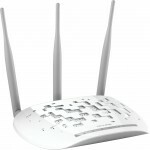 This Access Point can be used with a Netgear WNDR3700 but avoid using Smart IP. Posted by bioss at 10:31 pm on January 8th, 2014. Categories: support. Tags: TP-Link, wi-fi.